Endodontics is a branch of dentistry recognized by the American Dental Association as involving treatment of the pulp (root canal tissue) and surrounding tissues of the tooth. Endodontics emphasizes the preservation of the healthy, natural dentition to promote the highest quality of life. Why do I need to be referred to an endodontist? Beyond a DDS or DMD degree, an endodontist has a minimum of two additional years of advanced training specific to treatment of the pulp and surrounding tissues of the tooth. An endodontist is able to devote themselves to specific technologies and continuing education with the goal of optimizing your endodontic care. After you leave our office you will have a temporary filling in your tooth. You will need to return to your general dentist ASAP after you see us. This is usually done within 1-2 weeks. This is a very important step in the root canal procedure. The root canal needs a good seal with a filling or a crown to keep bacteria out of your tooth. This is essential to the success of the root canal procedure. It is our goal to partner with your referring dentist to provide you with optimal dental treatment. We are able to assist you in making the appointment with your dentist, who will recommend what type of restoration is necessary to protect your tooth. A record of your treatment and your final radiograph will also be sent to your dentist. Root Canal Therapy is a simple procedure that removes pulp tissue that has become infected or inflamed. The injured pulp is removed and the root canal system is thoroughly cleaned and sealed. Root canal therapy is one of the most common dental procedures with over 14 million completed every year. This simple treatment can save your natural teeth and prevent the need for dental implants or bridges. Will the tooth root be removed? During the root canal procedure we clean out the tunnels or channels inside the roots of the tooth. The root itself is not removed. What new technologies are used at Cornerstone Endodontics? Cone Beam Computer Tomography: is an innovative medical imaging technique that provides endodontists with three-dimensional views of the patient. In certain cases, CBCT greatly enhances the endodontist's ability to diagnose, evaluate, treat and care for patients. Operating Microscopes: We utilize surgical operating microscopes which have been proven to dramatically improve the quality and success of endodontic treatment. Magnification and fiber optic illumination are critical in identifying tiny details inside your tooth not visible to the naked eye. Apex (Root Tip) Locators: Apex locators are electronic devices which are employed to more accurately determine the length of the tooth root and may reduce the need for additional radiographs (x-rays). Ultrasonics: Ultrasonic instrumentation allows for the preservation of your tooth by removing only minute amounts of tooth structure. Ultrasonic instrumentation is particularly useful in locating hidden or calcified canals and other obstacles impeding access to tissue or bacteria within the canal spaces. Digital Radiography: Digital Radiography (x-rays) provides immediate imagery and dramatically lower radiation exposure. With appropriate care, teeth that have had endodontic treatment will last as long as your natural teeth. In rare cases, a tooth that has received endodontic treatment may fail to heal, may become re-contaminated or remain uncomfortable. Symptoms may occur months or even years after treatment. If so, endodontic retreatment may be needed. Your tooth will be numbed prior to any treatment. Our providers are very skilled at giving local anesthetic and making sure you are comfortable. Having a root canal procedure is similar to having a filling done. It can take a bit more time than a filling, approximately 45- 60 minutes. During this time many patients will fall asleep. We hear all the time "that was better than I thought it would be". After the root canal procedure, the ligament around the roots of your tooth called the periodontal ligament will be bruised. This will make the tooth sore to bite on. Just like any bruise on your body if you touch or mess with it you will notice the soreness a lot more. With teeth it will be noticeable the most with chewing and brushing. It is helpful to "baby" the tooth while the ligament heals by chewing on the other side. Continue brushing the area gently. The bruised feeling can last as long as other bruises last, most commonly 1-2 weeks. Some people heal slower and this may persist longer. Anti-inflammatory medications can be very helpful to decrease this soreness. Most traumatic dental injuries occur in children, but people of all ages can be affected. Whether the injury is the result of an automobile accident, a sports mishap, an altercation or a bad fall, the severity and type of injury will determine the treatment necessary. The long-term prognosis of the tooth and the prevention of complications depend on many factors including the length of time from injury to treatment; the nature of the injury; how your tooth was cared for after the injury; your body’s healing response; and the stage of tooth development. It is recommended that you contact your general dentist as soon as possible following any traumatic incident. Where can I go to find additional information? 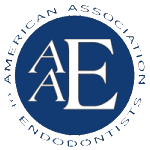 Additional patient information is available on the American Association of Endodontists and the American Dental Association websites. Click on the logos below to learn more.